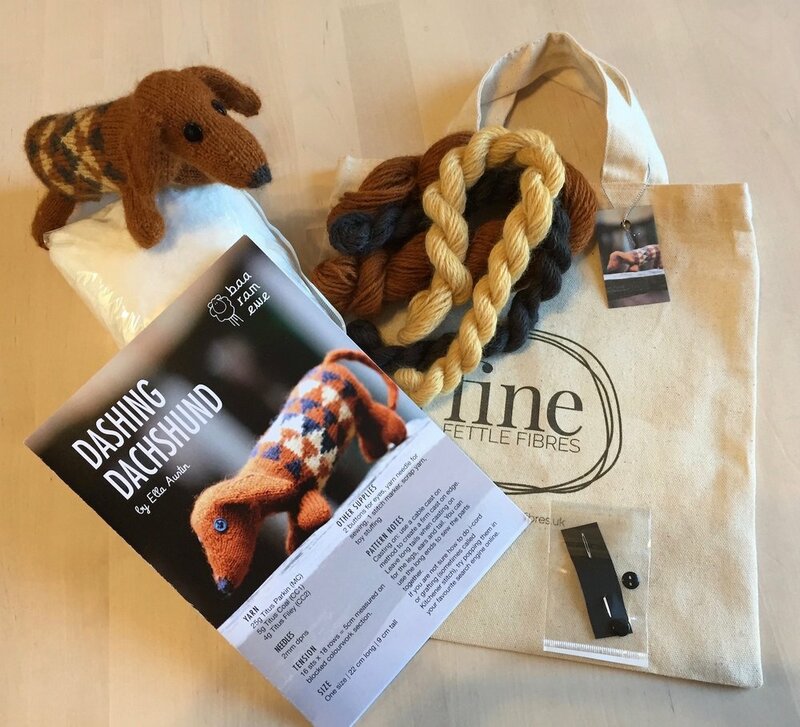 DACHSHUND KITS IN COLOUR PARKIN HAVE SOLD OUT BUT MORE ARE AVAILABLE WITH MAIN COLOUR ‘MILD’ - A SLIGHTLY DARKER BROWN – TEAMED WITH TEAL AND YELLOW CONTRAST COLOURS. Each of these kits contains a pattern from Baa Ram Ewe along with mini hanks of yarn and other notions, all packed into a cotton bag. As most of these patterns require more than one yarn colour, buying the pattern in one of these kits, with their mini-hanks, gives you all the pleasure of the project without the expense of buying full hanks of yarn. Please note these kits do not contain knitting needles which are available separately if needed. Your finished dachshund will be about 22cm long and 9 cm tall. Finished size approx. 45cm from cuff to bottom of heel; 27cm from back of heel to tip of toe.